There are many other ingredients in this salad but the title was getting ridiculously long. I could have added charred cherry tomatoes, black olives and a honey balsamic dressing. If you want to simplify matters you could use a pouch or two of Merchant Gourmet’s ready-cooked puy lentils. In the same vein, if you can’t be bothered to heat up the grill you can also crumble over some feta cheese in place of the halloumi. For the dressing, whisk all the ingredients together and season with a little salt and ground black pepper. For the salad, put the lentils in a saucepan and cover with cold water. Add the shallot and bay leaves and bring to the boil. Turn the heat down and simmer for about 18-20 minutes (check after 15 minutes, especially if you are cooking puy lentils). When the lentils are just tender, drain and refresh under cold water. Remove the shallot and bay leaves and put the lentils in a salad bowl. Season with salt and ground black pepper and pour over about one tablespoon of the dressing. While the lentils are cooking prepare the pecans. Heat the oven to 200˚c, fan oven 180˚, mark 6. 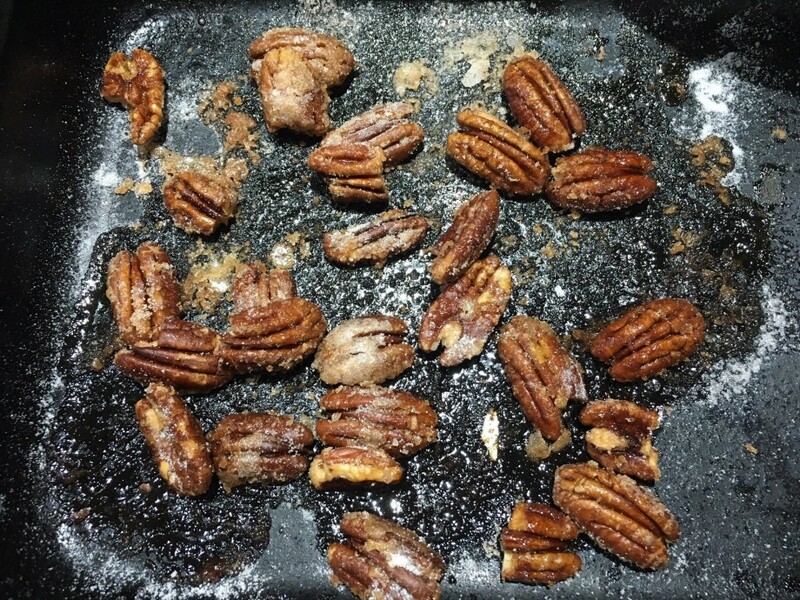 Put the pecans in a small roasting tin and spoon over 2 tablespoons water. Sprinkle with the caster sugar and shake over the Tabasco sauce. Roast in the oven for about 10 minutes until golden. Leave to cool then roughly chop the pecans and set aside. Heat a griddle pan until smoking hot. 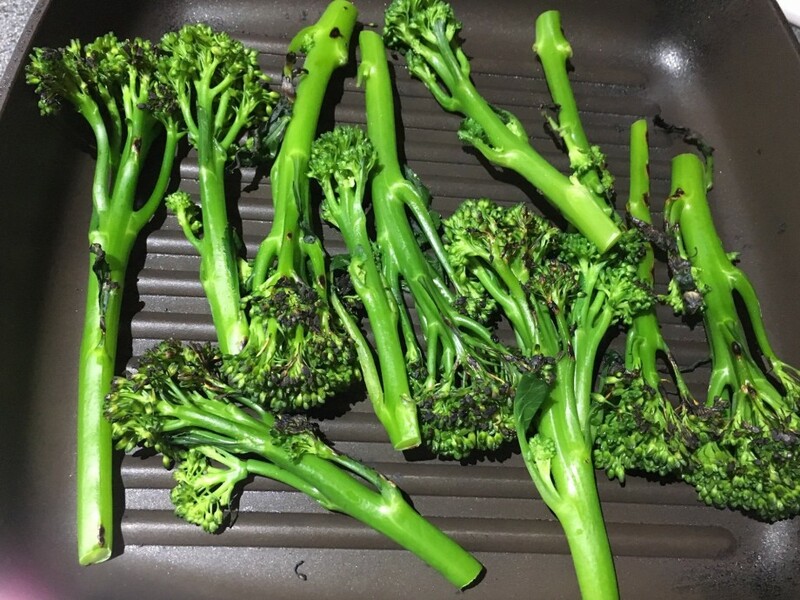 Spread the broccoli over the base and char-grill for about 2-3 minutes. Turn over and cook for a further 1-2 minutes. Arrange the broccoli stems over the lentils. Tip the cherry tomatoes into the griddle pan and char-grill for about 2 minutes. Spoon the tomatoes over the lentils and broccoli. Scatter over the black olives. Heat a grill to its highest setting. Thinly slice the halloumi and place on a baking tray. Brush the slices with a little olive oil and place under the grill for about 6-8 minutes until golden brown. Carefully turn over the cheese slices and grill for a further 3-4 minutes. 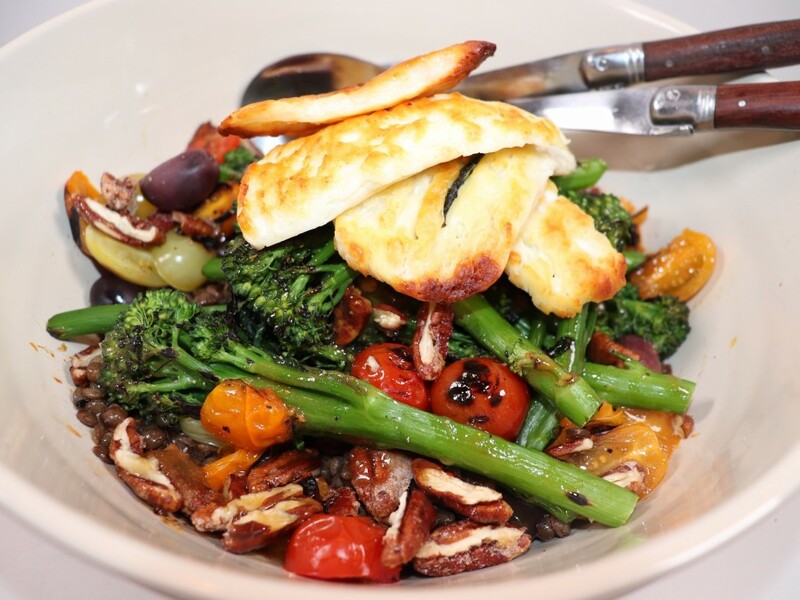 Place the halloumi on top of the salad and sprinkle over the candied pecans. Drizzle with the dressing and serve immediately.